In another forum in Brass Goggles, Aural-Ocular, under the post, "Just Glue Some Gears On It (And Call It Steampunk)", Zeppelin Overlord elShoggotho, brought up the Nernst Lamp. After looking at it on Wikipedia at : http://en.wikipedia.org/wiki/Nernst_lamp something caught my eye. This form of Incandescent lamp does NOT require a vacuum! Translation we might could make one. Some data on the device: You need a ceramic rod for lighting, and some way to heat it. Either a heating coil (historically made out of platinum) or some fire. A match is enough. Yup, that's an electric lamp you have to light. Life expectancy for the ceramic rod is about 700 hours. The inventor of the device, Walther Nernst, was known to be somewhat eccentric. He later went on to win a Nobel prize, and formulated the third law of thermodynamics. I've found a Chinese supplier for zirconium oxide - yttrium oxide. Not bad pricing, bu the minimum order is 20 Tons!!!! Will keep looking. I might be a noobcake for saying this, but... why not ask them for a sample? Or is that not done in that industry? I thought of that after my previous post. Our brainwaves must have synced up! It will not take much to make a thin wire. And I have access to a Ceramics Hobby shop and Keln. I have plenty of old large clear lamps. I even have several old hair driers for auction lots. So, hopefully I may soon have a working Nernst Lamp. I've been thinking about trying to build a Nernst lamp for some time, but I have no idea where to find a suitable source for the glower. One thought that crossed my mind was to try and adapt a Silicon carbide "Globar", which is somewhat similar to a Nernst glower. The SiC globar is electrically conductive at room temp, unlike the Nernst glower, so no need for the heater elements. But I have no idea about what sort of light output (if any) is available from a globar as they are primarily used for IR heating and near-IR light sources. Maybe it's possible to coat the globar with Yttria-stabilized zirconia, which would solve a few issues with building a working lamp... But I have a feeling that this will require either Sputter deposition or Plasma-enhanced chemical vapor deposition - neither of which are likely for any of us to do at home. Unless it could just be pasted on and dried? Maybe some sort of paint or cement like paste?? Maybe paint it on and fire, similar to a glaze. "For its hardness and optical properties in monocrystal form (see "cubic zirconia"), it is used as jewelry. As a material for non-metallic knife blades, produced by Boker and Kyocera companies." So it may be possible to find a widget that you can repurpose as the incandescent element in a Nernst lamp. I keep thinking that a carbon-arc lamp would be fun to build someday. I can get carbon rods at the local lab-supply place. Hmmm, possibly... The working temperature of the glower is around 1500 - 2000 degrees, which is somewhat higher than usually found in a kiln. I wonder how well it would hold up to that sort of temperature and thermal expansion / contraction though... Definitely a possibility though. Maybe a fine loose powder packed tightly / compressed into a silica tube would work? The silica would be fine at the working temperature, and narrow tubes are easy enough to find (lab supplies I would think a likely source). The trick to make a useable light source is to make a mechanism that moves the rods together as they burn away. Not too hard, plenty of info on the internet on how it was done originally (electromechanical would be my choice). Here is a cool site for the Nernst Lamp, available in either English or German. I'm still looking for a cheep supply of zirconium oxide - yttrium oxide. Automotive oxygen sensors use yttria-stabilized zirconia. I have no idea how big a piece is in them--they used to have a fairly large chunk of it, but I know the technology has changed since then. It might be worthwhile to stop by a garage and see if they have any old ones around. could you just use the sensor wire to pass current through the o2 sensor and then heat it, to see if it would glow? a junkyard sensor could do nicely, that and a propane torch. I guess the next question would be what voltage would you need and could it be AC or would it need DC? I hope the voltage is 110 volt or more. I would hate it if the lamp works on 12Volt DC. The last thing we need is yet another bright light on US Automobiles! Those #$@^& Bright lights, especially the blue tint ones are just too much! Should work on mains voltage. Remember that it was invented before easy transformers. The web site mentioned above is very interesting! From the photos and the various sales literature pictured on that site, it seems like the bulbs were made for regular 110 V AC supply. The screw base of the bulb appears to be the standard base. On the home page of that site, it does mention that the O2 sensors in cars use the same technology, so it might be interesting to try it out with one of them. Don't know if the contacts are made to support that higher voltage, so be careful. Heating the ceramic element up with a propane torch until it gets conductive is a good idea too. I don't know if the O2 sensors have an internal filament to heat them or they rely upon the heat from exhaust gases. It is a shame to admit , but this thread was the first time I heard about the Nernst lamp. The incandescent lamp operating in air intrigued me so I decided to make one. The next step will be to build the electric preheaters and the iron wire current limiter like the ones used in the original Nernst lamps. The reason we chase is lost in romance. And still we try to justify the waste for a taste of man's greatest adventure. Nicely done my dear fellow!! Somebody give this man a cigar! I mulled over the idea of trying to use a bit of ceramic knife to do what you just did, but figured it would be both too expensive to buy, and too difficult to cut into the right sized pieces. A potato peeler would never have crossed my mind. I will be on the look out for such items in the upcoming post Christmas sales! Out of curiosity, what voltage were you using, and what was the current draw (if you measured it)?? Fantastic! The build, the location of inexpensive element material and the video! I gave your video a "LIKE", and for you sir, I give the honorable rank of "Ships Engineer" on the "Queen Victoria's Revenge". 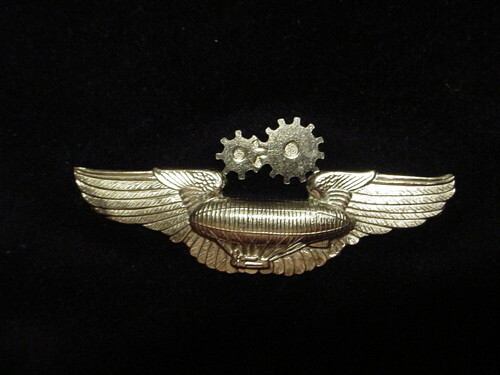 With the position goes the following Engineers Wings to be displayed as you wish along with all the honors and privileges that go with them. I wonder, if the element was thinner, would the voltage required decrease? I just found this video, which details some of the construction details of the original lamps. They had a special type of current limiter, and heating coils, to make the lamp start itself. There also was an early type of bi-metallic switch, to turn off the heater once its work was done. Ah, so about 40W then - that's not too shabby! I Think with several slightly narrower strips (same thickness), and a glass dome to keep the air currents from cooling them too much, the efficiency could be raised up a little more. Same with using a constant current source rather than a dropping resistor. Just do it like the late Victorians. Make your Nernst lamp with Edison screw fittings, damn his dead eyes. in one of the links posted mention of modern lamps with silicon carbide parts is mentioned which requires no preheating, surely this would be more practical or have i totally missed mention of it? How hot do the other rods need to be heated to to be able to conduct the electrickery? Let's eat Grandpa. Let's eat, Grandpa. Punctuation can save someone's life. As far as I can tell, the silicon carbide (which I think I mentioned earlier in the thread) is an IR source, ie it glows red and gives out heat much like a radiant electric heater element (which is what it is). It's the other materials mixed into the ceramic that glow with the heat to provide light. Heating a Silicon carbide (SiC) heating element up to the temperature needed for white light, it would basically melt. As for how hot the glower has to be to conduct, I believe it is around 2 - 300 deg C. as it is so small, the heating time would be fairly quick, basically however long it take the heater to reach operating temperature and how close it is to the glower. Probably no more than 10 to 20 seconds for the original lamp, though this could be reduced by various means, such as wrapping a heating coil in direct contact with the glower. Okay, maybe this is a totally stupid idea, but could you use silicon carbide for the heater in a Nernst lamp?